The Spam Jam street festival yesterday along Kalakaua Avenue in Waikiki, sponsored by SJ Foundation, aimed to collect 10,000 cans of Spam for the Foodbank. 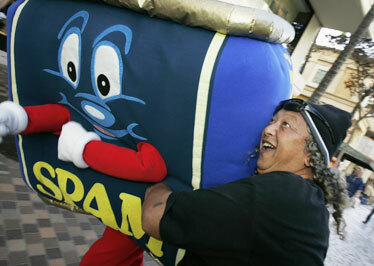 Joseph Espinda Jr. gave the Spam mascot a big hug. 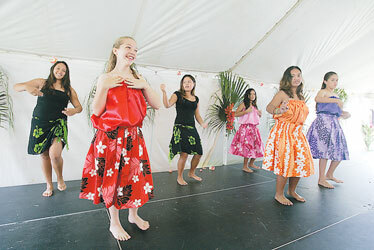 Saint Francis School seventh- and eighth-graders, front row from left, Bianca Dukesherer, Alexis Abaya and Nicole Condon; and, back row from left, Tiffany Trantham, Jade Nakatani and Jorel Clarke, perform yesterday at the school's annual Ohana Fair.